Peace Corps Online: April 6, 2004 - LA Times: Schwarzenegger says he now understands what his father-in-law, Sargent Shriver, was talking about all those years while trying to explain "the joy of public service." 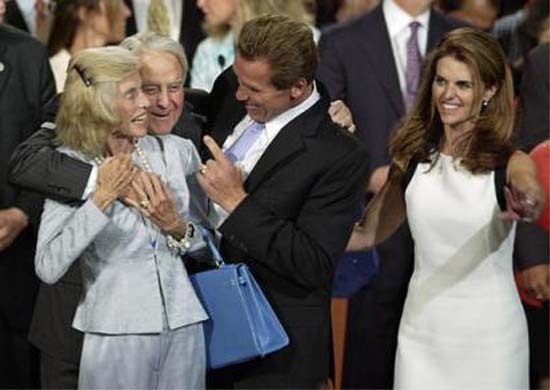 April 6, 2004 - LA Times: Schwarzenegger says he now understands what his father-in-law, Sargent Shriver, was talking about all those years while trying to explain "the joy of public service." Peace Corps Online: Peace Corps News: Directors of the Peace Corps: Peace Corps Founding Director Sargent Shriver: Sargent Shriver: Archived Stories: April 6, 2004 - LA Times: Schwarzenegger says he now understands what his father-in-law, Sargent Shriver, was talking about all those years while trying to explain "the joy of public service." This month Governor Schwarzenegger praised the Peace Corps before the Republican National Convention: "We're the America that sends out Peace Corps volunteers to teach village children." Schwarzenegger has previously acknowledged his debt to his father-in-law, Peace Corps Founding Director Sargent Shriver, for teaching him "the joy of public service" and Arnold is encouraging volunteerism by creating California Service Corps and tapping his wife, Maria Shriver, to lead it. Leave your comments and who can come up with the best Current Events Funny? Schwarzenegger says he now understands what his father-in-law, Sargent Shriver, was talking about all those years while trying to explain "the joy of public service." Schwarzenegger says he now understands what his father-in-law, Sargent Shriver, was talking about all those years while trying to explain "the joy of public service." Shriver was the first director of the Peace Corps and later U.S. ambassador to France. "My father-in-law said to me, 'Hey, it's the most rewarding thing to be a civil servant,' " the governor recalls. "I didn't quite get it…. Now I totally get it…. I am so excited with this job…. It's really incredible." The Orange County Register published those quotes. They were among the gems produced in a series of nine newspaper interviews the governor gave Capitol beat reporters Tuesday. I called Schwarzenegger's office for some elaboration and was invited over to talk to the governor himself. We met in a tent, certainly the most unique place I'd ever been in the horseshoe-shaped governor's office complex on the Capitol's first floor. The brown, family-size tent is erected on an outdoor patio in the horseshoe's center. Staffers and visitors, peering through office windows, cannot see who's in the shelter, which has a heater to ward off the chill. The governor spends perhaps two hours a day there, aides say. "The purpose really is just to get away from the office, a place where you can put your feet up," Schwarzenegger explains. "People feel more relaxed. Like kicking back." It's also a place where he can occasionally light up a stogie. Schwarzenegger's nights in Sacramento — three or four a week — are spent in a hotel across the street. He enjoys the convenience. There's a gym nearby. Often his wife, Maria, and four children visit. "What is wonderful is my family has gotten into a groove now," he says. "We have worked up sort of a rhythm that everyone is very happy about. My wife is at a good place. She was really worried in the beginning about what this would all mean [for] the family…. So all of this has calmed down. And now everyone is enjoying it." Maria Shriver has her own office in the horseshoe. When Sargent Shriver used to expound about being a public servant, the governor remembers, "I was listening in fascination. 'How can he have so much joy with that?' Because I was at a different place in my life…. I was so much into making millions of dollars, be rich and famous, drive great cars, have big homes, a great career…. "Then all of a sudden you get to a stage where you say, 'How can I balance it out, the making and the taking?' Then you go through a stage where you say, 'You know, it really doesn't matter whether I make anything. Let me just give something back.' 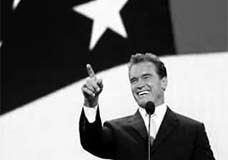 "
He had viewed running for governor as "kind of like a duty," Schwarzenegger says, but has found the job to be "such a great pleasure." People warned him about "this workers' comp thing," he says. " 'It's so complicated. It's going to be frustrating' and all this stuff…. I found it fascinating. Really interesting…. "I see it as a positive thing…. I have a vision of where I want to go and therefore I'm enthusiastic to get there…. It's great when you can drive a thing forward in a positive way and then people walk over and say, 'That's great. We did it.' "
Will three years be enough? "I believe very strongly in the idea of going in and fixing some of the problems and getting out," says Schwarzenegger, 56. "Now, how long does it take? This is the thing we don't know. There are tremendous problems. Economy. Energy. Education. "At what point do you say, 'OK, I should stay?' Or 'I think I've fixed the things I wanted to fix,' and then move on. Come end of this year, beginning of next, we will have a feeling." Advice to Democrats: Your best hope of getting rid of Schwarzenegger is to work with him. Help him fix things, cross the items off his "do" list. Then maybe he'll leave town.